Reviews - HILDA McGILDA, "The Witch Who Was Too Pretty"
Books-A-Million, Barnes & Noble, and Amazon.com, be the first to write reviews on their sites. Thank you for helping us spread Hilda's magic! HILDA McGILDA goes to school!!! Author Michele Verhoosky was delighted to learn that Hilda McGilda continues to spread her magic, and is now a "must read favorite" amongst the elementary school set. Her granddaughter, Lily, (who lives in New England) just informed her mother that she "needs to bring Hilda McGilda back to school tomorrow." Apparently they are now reading Hilda McGilda in Lily's class! Hilda McGilda has earned 5-star reviews from Amazon.com and been acclaimed "a new children's classic!" 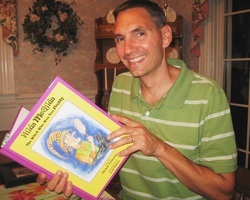 McGilda Fun, September 6, 2010 By daisygirl8 - See all my reviews This review is from:Hilda McGilda: The Witch Who Was Too Pretty (Hardcover) This is a darling book with a great message of "Be who you are"! (Also that beauty doesn't make you happy - it's what's inside that counts.) The rhyming story is delightful and the art work is wonderful! A fun book for any age! 5.0 out of 5 stars Delightful reading, August 2, 2010 By meg hogan (altoona, fl., US) - See all my reviews This review is from: Hilda McGilda: The Witch Who Was Too Pretty (Hardcover) I loved the story and humor in this book and the illustrations were wonderful. I hope there will be another! Michele--I just saw your book when I bumped into Jean. I started reading it right there and she said, "Are you going to talk to me or are you just going to read?" I raced right in and called to place my order. The words in this book are just incredible! And I love the fact that Hilda's so colorful and creative and not at all the stereotypical witch. This is a great book to read aloud! Parents and adults are going to love it every bit as much as the children! I'm going to tell every child and parent I know about this book--it's that good! a special child and yourself !!! Hilda McGilda is a gift treasured by all generations!!! Little kids LOVE Hilda McGilda!!! 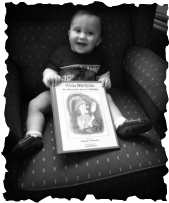 11-month-old Ethan, great-nephew of author, Michele Verhoosky, shares belly laughs and magical moments of delight with Hilda McGilda. Michele--Our 9 year old grandaughter adores your book. She brought it into school and showed it to her teacher, who immediately let her read it out loud to the class. Even though they are reading chapter books, they all loved Hilda. It wasn't at all "too baby" for them, thanks to your terrific language and rhyme scheme and word play. Heck, I love reading like HILDA McGILDA!" Michele--I wanted to let you know that I was the winner of the HILDA McGILDA gift basket (donated by fan, Joy Buckholtz) at the Susan Komen Ladies Golf Tournament in Lockwood Folly. I LOVE your book! I love it so much I am keeping it out on my coffee table, and will be ordering more copies for gifts for my granddaughters for Christmas! You and Lois did such a great job!